A contrail is the condensation trail that is left behind by a passing jet plane. Contrails form when hot humid air from jet exhaust mixes with environmental air of low vapor pressure and low temperature. Vapor pressure is just a fancy term for the amount of pressure that is exerted by water vapor itself (as opposed to atmospheric, or barometric, pressure which is due to the weight of the entire atmosphere above you). The mixing occurs directly behind the plane due to the turbulence generated by the engine. 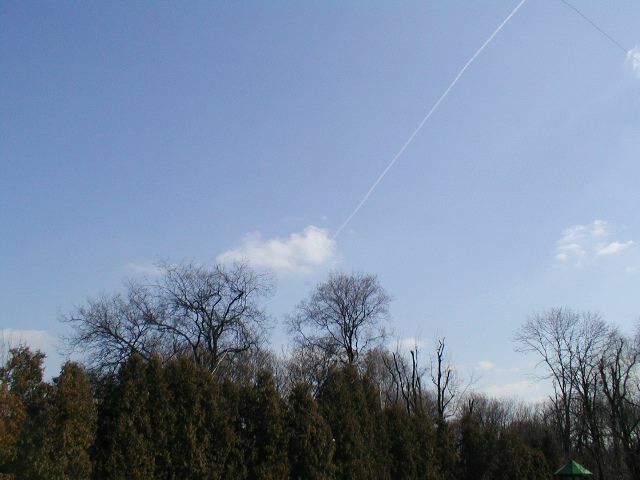 If condensation (conversion from a gas to a liquid) occurs, then a contrail becomes visible. Since air temperatures at these high atmospheric levels are very cold (generally colder than -40 F), only a small amount of liquid is necessary for condensation to occur. Water is a normal byproduct of combustion in engines. Air traffic and, therefore, contrails, are not evenly distributed around the globe. They are concentrated over parts of the United States and Europe, where local warming reaches up to 0.7 watts per square meter, or 35 times the global average. The contrails often turn into cirrus clouds, a thin, wispy type of cloud made of ice crystals. The most common form of high-level clouds are thin and often wispy cirrus clouds. Typically found at heights greater than 20,000 feet (6,000 meters), cirrus clouds are composed of ice crystals that originate from the freezing of super cooled water droplets. Cirrus generally occur in fair weather and point in the direction of air movement at their elevation. While some clouds tend to help cool the globe and negate the affects of global warming, thin cirrus clouds are heat trappers, holding in more heat than they reflect back into space. Present commercial aircraft fly at altitudes of 8-13 km. The emissions from such air traffic can change the atmospheric composition: Directly: by emitting carbon dioxide (CO2), nitrogen oxides (NOx = NO + NO2), water vapor, hydrocarbons, soot, and sulfate particles. Indirectly: by a chemical reaction chain similar to smog-formation the greenhouse gas ozone (O3) can be formed. In this reaction chain nitrogen oxides act as a catalyst under the influence of sunlight. As a result of these chemical reactions also the concentration of methane (CH4), another greenhouse gas, decreases. These changes can have effects on climate: Ozone, CO2, and water vapor are greenhouse gases and their increase has a warming effect. Methane is also a greenhouse gas and its decrease has a cooling effect. Aerosols (sulfate particles, soot) could have a cooling effect. Contrails formed due to the emission of particles and water vapor can increase the cloud cover in the upper troposphere. This may result in a cooling or heating depending on the size and optical depth of the ice crystals of which the contrails consist. Presently it is believed that contrails lead to a net warming effect. There may be changes in (non-contrail) upper level clouds: Most contrails decay after minutes to hours, but some continue to exist and are then not distinguishable from natural cirrus clouds . Persistent (non-spreading) contrails look like long white lines that remain visible after the airplane has disappeared. This shows that the air where the airplane is flying is quite humid, and there is a large amount of water vapor available to form a contrail. Persistent contrails can be further divided into two classes: those that spread and those that don't. Persistent contrails look like long, narrow white pencil-lines across the sky. Contrail cousins are things that look like contrails but actually arise from a different physical process. For example, under the right conditions you will see vapor trails form from the wingtips of a jet on takeoff or landing. This phenomenon results from a decrease in pressure and temperature in the wingtip vortex. If conditions are right, liquid water drops form inside the vortex and make it visible. These evaporate very quickly after they form. Clouds play a complex role in the Earth's radiation budget. Low Clouds reflect much of the sunlight that falls on them, but have little Effect on the emitted energy. Thus, low clouds act to cool the Current climate. High clouds reflect less energy, but trap more of The energy emitted by the surface. From the burning of fossil fuels, aircraft produce about 3 percent of annual global emissions of carbon dioxide (CO2), the most important greenhouse gas. There is good scientific understanding of the impact of these emissions, which is the same as for CO2 at the earth's surface, such as from autos or power plants. At high altitudes (25,000 to 50,000 feet), nitrogen oxide (NOx) emissions affect the production of ozone and the concentration of methane, both potent greenhouse gases for which a fair scientific understanding has developed. The third effect results from emissions of aerosol and particulate matter at high altitudes, and can be observed by the apparent increased incidence of cirrus clouds and the persistence of contrails, which influence the radiative character of the atmosphere. There is increasing knowledge about these effects, but poor scientific understanding. This fact sheet describes the formation, occurrence, and effects of “condensation trails” or “contrails.” It was developed by scientific and regulatory experts at the Environmental Protection Agency (EPA), the Federal Aviation Administration (FAA), the National Aeronautics and Space Administration (NASA), and the National Oceanic and Atmospheric Administration (NOAA) in response to public inquiries regarding aircraft contrails. Contrails are line-shaped clouds sometimes produced by aircraft engine exhaust, typically at aircraft cruise altitudes several miles above the Earth’s surface. The combination of water vapor in aircraft engine exhaust and the low ambient temperatures that often exists at these high altitudes allows the formation of contrails. Contrails are composed primarily of water (in the form of ice crystals) and do not pose health risks to humans. They do affect the cloudiness of the Earth’s atmosphere, however, and therefore might affect atmospheric temperature and climate. The basic processes of contrail formation described in this fact sheet apply to both civil and military aircraft. Contrails are line-shaped clouds or “condensation trails,” composed of ice particles, that are visible behind jet aircraft engines, typically at cruise altitudes in the upper atmosphere1. 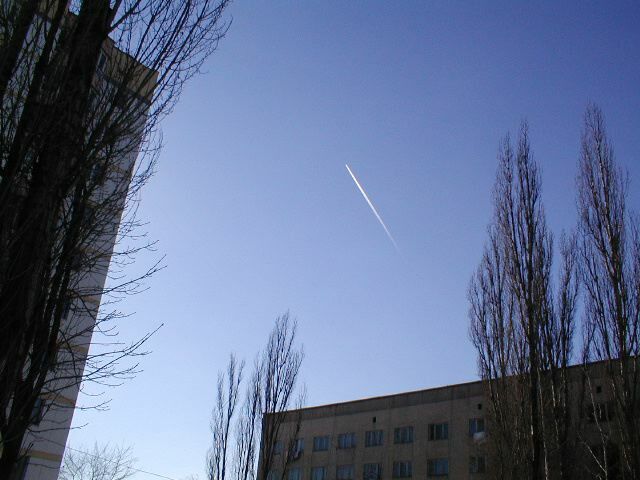 Contrails have been a normal effect of jet aviation since its earliest days. Depending on the temperature and the amount of moisture in the air at the aircraft altitude, contrails evaporate quickly (if the humidity is low) or persist and grow (if the humidity is high). Jet engine exhaust provides only a small portion of the water that forms ice in persistent contrails. Persistent contrails are mainly composed of water naturally present along the aircraft flight path. How are aircraft emissions linked to contrail formation? Aircraft engines emit water vapor, carbon dioxide (CO2), small amounts of nitrogen oxides (NO), hydrocarbons, carbon monoxide, sulfur gases, and soot and metal particles formed by the high-temperature combustion of jet fuel during flight. Of these emittants, only water vapor is necessary for contrail formation. Sulfur gases are also of potential interest because they lead to the formation of small particles. Particles suitable for water droplet formation are necessary for contrail formation. Initial contrail particles, however, can either be already present in the atmosphere or formed in the exhaust gas. All other engine emissions are considered nonessential to contrail formation. For a contrail to form, suitable conditions must occur immediately behind a jet engine in the expanding engine exhaust plume. A contrail will form if, as exhaust gases cool and mix with surrounding air, the humidity becomes high enough (or, equivalently, the air temperature becomes low enough) for liquid water condensation to occur. The level of humidity reached depends on the amount of water present in the surrounding air, the temperature of the surrounding air, and the amount of water and heat emitted in the exhaust. Atmospheric temperature and humidity at any given location undergo natural daily and seasonal variations and hence, are not always suitable for the formation of contrails. If sufficient humidity occurs in the exhaust plume, water condenses on particles to form liquid droplets. As the exhaust air cools due to mixing with the cold local air, the newly formed droplets rapidly freeze and form ice particles that make up a contrail . Thus, the surrounding atmosphere’s conditions determine to a large extent whether or not a contrail will form after an aircraft’s passage. Because the basic processes are very well understood, contrail formation for a given aircraft flight can be accurately predicted if atmospheric temperature and humidity conditions are known. After the initial formation of ice, a contrail evolves in one of two ways, again depending on the surrounding atmosphere’s humidity. If the humidity is low (below the conditions for ice condensation to occur), the contrail will be short-lived. Newly formed ice particles will quickly evaporate as exhaust gases are completely mixed into the surrounding atmosphere. The resulting line-shaped contrail will extend only a short distance behind the aircraft. If the humidity is high (greater than that needed for ice condensation to occur), the contrail will be persistent. Newly formed ice particles will continue to grow in size by taking water from the surrounding atmosphere. The resulting line-shaped contrail extends for large distances behind an aircraft . Persistent contrails can last for hours while growing to several kilometers in width and 200 to 400 meters in height. Contrails spread because of air turbulence created by the passage of aircraft, differences in wind speed along the flight track, and possibly through effects of solar heating. What are the ingredients of jet fuel, and are they important to contrail formation? All jet fuel is a hydrocarbon mixture containing small amounts of impurities and additives. All aircraft jet fuel is analyzed for strict impurity limits before use. The hydrocarbon content of jet fuel produces water vapor as a by-product of combustion. Contrails would not form behind aircraft engines without the water vapor by-product present in exhaust. A common impurity in jet fuel is sulfur (~0.05% by weight), which contributes to the formation of small particles containing various sulfur species. These particles can serve as sites for water droplet growth in the exhaust and, if water droplets form, they might freeze to form ice particles that compose a contrail. Enough particles are present in the surrounding atmosphere, however, that particles from the engine are not required for contrail formation. There are no lead or ethylene dibromide additives in jet fuel. Additives currently used in jet fuels are all organic compounds that may also contain a small fraction of sulfur or nitrogen. 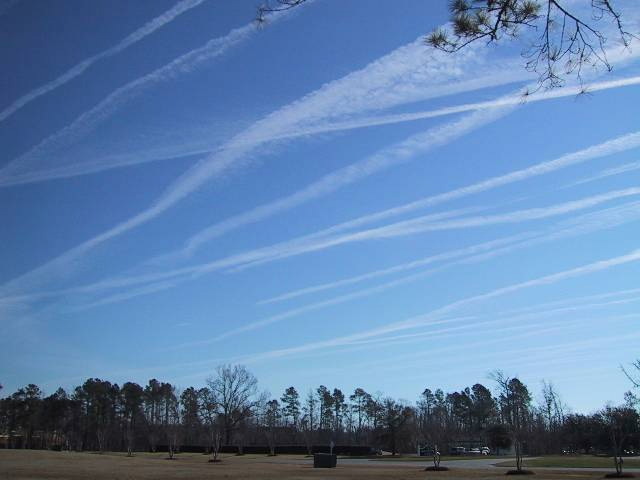 Persistent contrails are of interest to scientists because they increase the cloudiness of the atmosphere. The increase happens in two ways. First, persistent contrails are line-shaped clouds that would not have formed in the atmosphere without the passage of an aircraft. Secondly, persistent contrails often evolve and spread into extensive cirrus cloud cover that is indistinguishable from naturally occurring cloudiness (See Figure 3). At present, it is unknown how much of this more extensive cloudiness would have occurred without the passage of an aircraft. Not enough is known about how natural clouds form in the atmosphere to answer this question. Changes in cloudiness are important because clouds help control the temperature of the Earth’s atmosphere. Changes in cloudiness resulting from human activities are important because they might contribute to long-term changes in the Earth’s climate. Many other human activities also have the potential of contributing to climate change. Our climate involves important parameters such as air temperature, weather patterns, and rainfall. Changes in climate may have important impacts on natural resources and human health. Contrails’ possible climate effects are one component of aviation’s expected encing climate was recently assessed to be approximately 3.5 percent of the potential from all human activities (See Box 1). cover can be accurately measured . The highest percentages of cover occur in regions with the highest volume of air traffic, namely over Europe and the United States . This estimate of contrail cloudiness cover does not include extensive cirrus cloudiness that often evolves from persistent line-shaped contrails. Some evidence suggests that this additional cirrus cloudiness might actually exceed that of line-shaped cloudiness.